BEXAR COUNTY, Texas (KTRK) -- Dozens of venomous snakes went missing after a rollover crash in Bexar County on Thursday. But emergency services have since recaptured 23 of them. The snakes escaped when a minivan carrying the snakes blew a tire, causing it to roll over. The driver of the van and his 9-year-old grandson were trapped inside, along with a baby alligator and a tortoise. But somehow the snakes managed to slither away. A local emergency services responder shared numerous photos of the incident to Twitter. The photos show emergency services personnel inspecting the scene and collecting loose snakes. Both the driver and his grandson were taken to San Antonio Military Medical Center as a precaution. Texas Parks and Wildlife enlisted employees from New Braunfels Snake Farm and the San Antonio Zoo to help with the snakes' recapture. As for the other seven snakes... fingers crossed they haven't slithered very far. 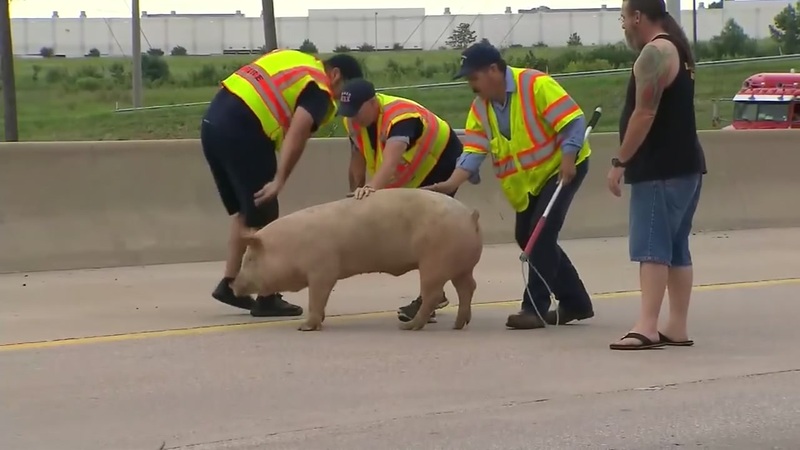 Pigs that were loaded on a big rig are wandering on I-45 outside Dallas this morning after the truck overturned.